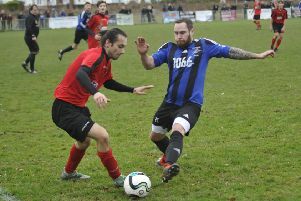 Westfield Football Club joint manager Jack Stapley was satisfied with a point from last weekend’s 1-1 draw at home to Roffey. The Westies made it seven points from a possible nine in Macron Store Southern Combination League Division Two after the third versus second clash ended all-square. Stapley said: “I would’ve taken a point at the start of the day, definitely, and we got our just reward really. I think it was a satisfactory point really. Both teams went hell for leather and for a neutral it would’ve been a really good game to watch. “It was a difficult game and a decent game that probably either side could’ve won. I think we maybe had a couple of clearcut opportunities, but at the other end Gavin Bourne pulled off some spectacular saves - one from a corner that wouldn’t have looked out of place in a David De Gea highlight reel. “Both sides tried to play. We wanted to try and play more football and we definitely did that. They’re a good side and they deserve to be where they are at the moment. Kevaughn Ward’s early strike was cancelled out by a second half equaliser as Westfield recorded their first draw for six months. Although held in difficult cold conditions, the game was played at a very high pace and there were plenty of opportunities at either end. Westfield took just two minutes to open the scoring. Josh Carey cut out a pass from Roffey’s goalkeeper towards their left-back and crossed for Ward, fresh off his hat-trick against Ferring the previous weekend, to tap in at the far post. Roffey grabbed a share of the spoils thanks to a goal in the last 15 minutes. An attack down the away left ended with the ball being cut back to Ben Hands, who curled a good finish just beyond the reach of Westfield goalkeeper Gavin Bourne. Those were the only goals, but there might well have been others. For Westfield, Carey was denied by a great save when he flicked Ward’s cross to the near post goalwards and Stapley just missed the target at a corner. Westfield got on top in the last 10 minutes and Ward had a couple of chances, one of which was well blocked by the goalkeeper in a one-on-one situation. Roffey certainly had their moments too. Bourne produced a terrific double save during the first half and right on the stroke of half time made a phenomenal reaction stop at a corner. Aaron Cochrane did a really good job for Westfield in the holding midfield role. Westfield: Bourne; McGurk, Stapley, Dicken, Gravett (Higgins); McMinigal, Cochrane, J. Ward, Adams; K. Ward, Carey (Barrett). Although only two points off the top, Westfield - the division’s highest scorers - are just four points above the team in sixth and no side has played more matches. “After the start we had I’m very happy with where we are,” Stapley added. “It may look like a false position because of the amount of games people have played, but just because teams have got games in hand, they may have to play midweek games and that becomes very difficult at our level. Westfield are without a fixture this coming weekend as several members of the squad will be in Holland watching England.